Spondylosis, also known as spinal osteoarthritis, can affect the lumbar, thoracic, and/or the cervical regions of the spine. It is most frequently found in the lumbar spine since the lumbar spine carries most of the patient’s weight. Lumbar spondylosis is principally a disease of mid and later life. As the lumbar discs and associated ligaments undergo aging, the disc spaces frequently narrow. Thickening of the ligaments that surround the disc and those that surround the facet joints develops. This ligamentous thickening may eventually become calcified. Narrowing of the spinal canal or of the openings through which the spinal nerves leave the spinal canal can occur. Compression of the nerves within the spinal canal or the nerves exiting the spinal canal can lead to pain, numbness or weakness in the legs, buttock or bowel and bladder. Abnormalities of gait can occur. 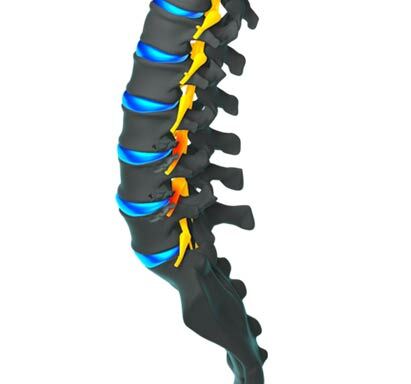 Occasionally, these degenerative changes can produce instability of the spine. Sitting for prolonged periods of time may cause pain and other symptoms due to pressure on the lumbar vertebrae. Repetitive movements such as lifting and bending (e.g., manual labor) may increase pain.